It’s not really news that hailing a cab in the middle of the night is getting harder. 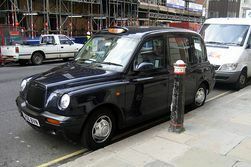 We can remember the days when you could step out of a bar at midnight or tumble out of a club rather later and still expect to find a magical proliferation of roomy, comfy Hackney Carriages to spirit you home. Alright, you might dent your overdraft but at least you didn’t have to hunt down a smelly, packed nightbus that unfathomably took 3 times as long to get you home compared to its daytime incarnation. Astonishing figures from the London Chamber of Commerce today confirm the problem noting that there are more licensed cab drivers on the road today aged over 70 than under 30. This is causing a "severe shortage" of taxis, particularly late at night because our older drivers can’t be arsed to work all hours or weekends. And who can blame them? We can’t imagine its much fun being accosted by herds of young and shouty drunk people in the middle of the night and asked to drive to Welling when you could be out with your Freedom Pass enjoying a few bevvies yourself. And on average, it takes 40 months to pass it. That’s over 3 years of memorising London and an intimidating number of written and oral assessments to complete. Given that you can start studying for The Knowledge at 18, one can see how A-levels might seem like an easier option and a quicker route to a qualification and working prospects. On the plus side, as the PCO note encouragingly on their recruitment pages, one of the advantages of being a cabbie is that your brain will grow. Oh, well then, sign me up, now! Fortunately, various incentives and fast track schemes are also recommended to help get a new fleet of younger drivers out there ready to be hailed and more marshalled taxi ranks for us lot left waiting forlornly on the kerb at the witching hour with no hope of spotting a welcoming orange "for hire" sign. Londonist can only hope that ITV’s celebrity cab driving reality tripe doesn’t scupper everyone’s efforts.